The Society is delighted to announce that a total of £1500 was raised by members during the annual Charity Challenge, which took place during three weeks in May. The Challenge celebrated the 60th anniversary of the publication of Book Two of Wainwright’s Pictorial Guides: The Far Eastern Fells. Eighty locations mentioned in the book were visited by members including Long Stile on High Street, the path being repaired by Fix the Fells in 2018 with donations from the Society. 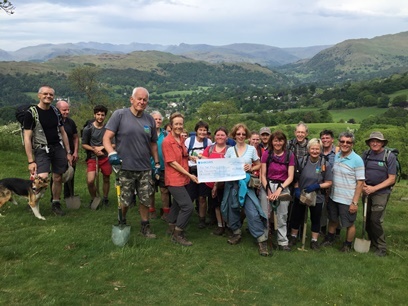 Members of the Society met on the slopes of Wansfell near Ambleside on the final day of the Challenge with volunteers from Fix the Fells, the main beneficiary being supported by The Wainwright Society in 2017. Society Secretary, Derek Cockell explained that when Wainwright came this way 60 years ago, there were fewer people walking the fells. Wainwright wrote in his conclusion to Book 2 ‘Usually I walked from morning till dusk without a sight of human beings.’ But the tremendous work by Fix the Fells in repairing footpaths in this area was testament to the growing popularity of walking on these fells. He thanked the dedicated band of volunteers for the amazing job they were doing. Further donations will be given to Fix the Fells from sales of the Society’s 2018 Calendar, which goes on sale later in the year.